CHINA—Earthquake victims in Juyuan Town are suffering still. Only three weeks after the 7.8 earthquake, the local government has stopped providing relief aid, leaving survivors to manage on their own, amidst horrendous living conditions. 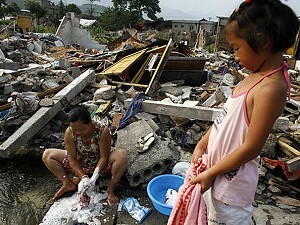 Mr. Fu told The Epoch Times the government had stopped supplying the town residents with relief goods over a week ago. They used to be given instant noodles, water and sometimes bread. Now everyone only receives a pound of rice a day. According to Mr. Fu, after the earthquake China's State Department promised a 3 month subsidy of 300 yuan (US$43) for every victim who does not have any income. “The subsidies were given to us after June 1. However, some of us only received 150 yuan so far and in some places people were only given 10 yuan a day,” said Fu. Mr. Fu attributed the current difficult conditions to the Chinese Communist Party's one party dictatorship. “There are many people who view themselves as members of the KMT [Kuomintang – Chinese Nationalist Party in Taiwan] in China. Being one of them, I'd like to formally join the KMT. We hope that the KMT will come to China to end the CCP's one party rule. Otherwise China will never progress.” He added that many earthquake victims had similar thoughts.